Download "Computer Programming. 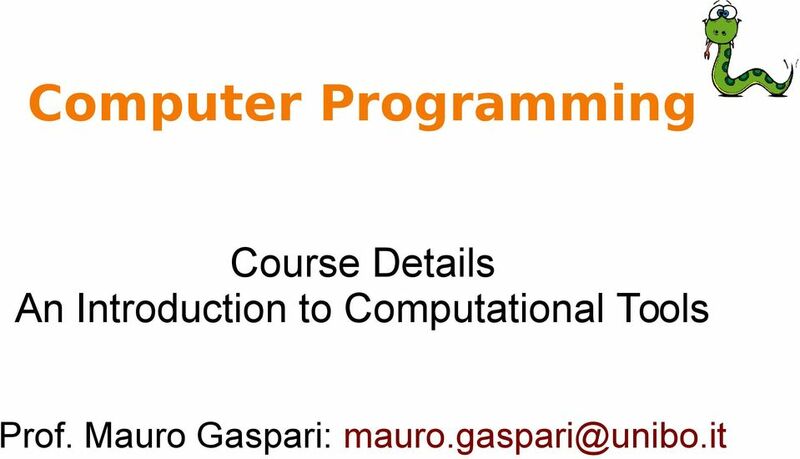 Course Details An Introduction to Computational Tools. 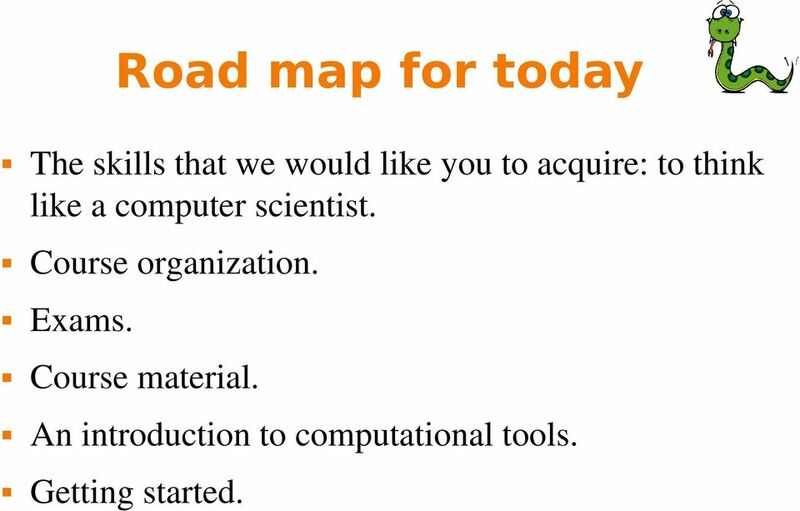 Prof. Mauro Gaspari: mauro.gaspari@unibo.it"
2 Road map for today The skills that we would like you to acquire: to think like a computer scientist. Course organization. Exams. Course material. An introduction to computational tools. Getting started. 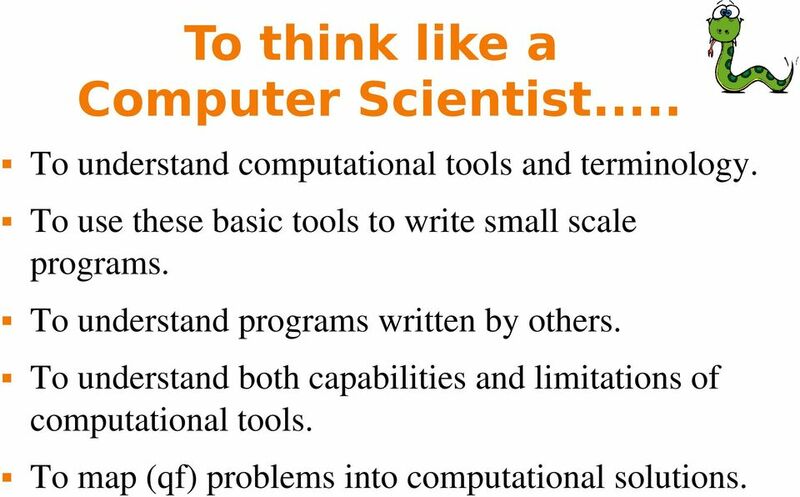 3 To think like a Computer Scientist... To understand computational tools and terminology. To use these basic tools to write small scale programs. 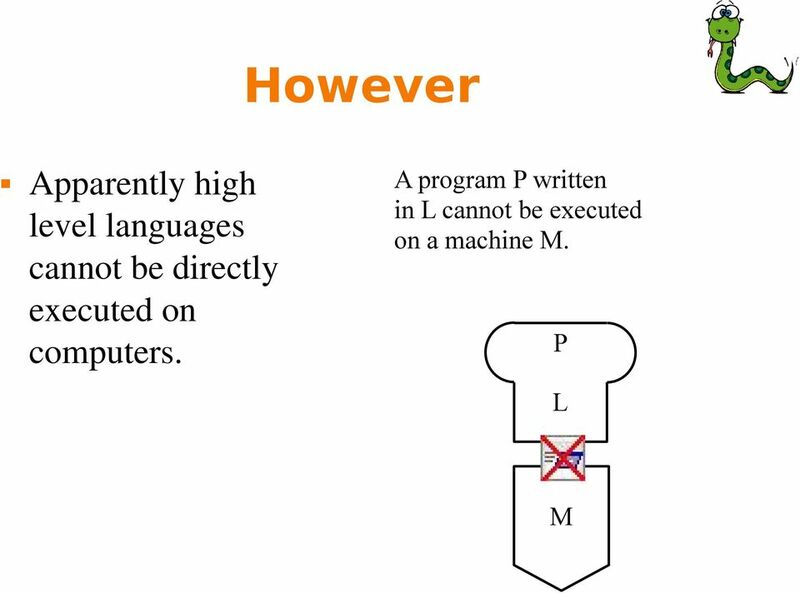 To understand programs written by others. To understand both capabilities and limitations of computational tools. 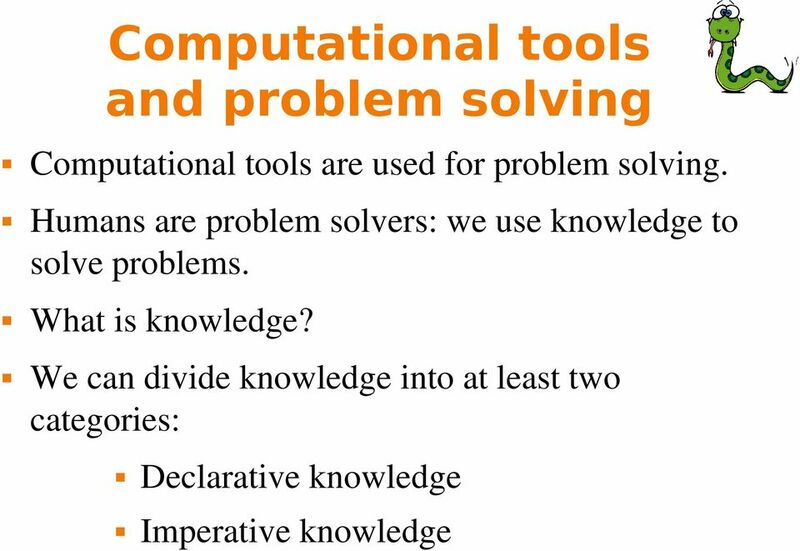 To map (qf) problems into computational solutions. 4 Python Computational solution will be implemented in Python a modern programming language. This course is not about Python (e.g. studying Python details), but it is about using it to think and build computational solutions. Warning!!! reading the textbook is not enough, exercises are fundamental. 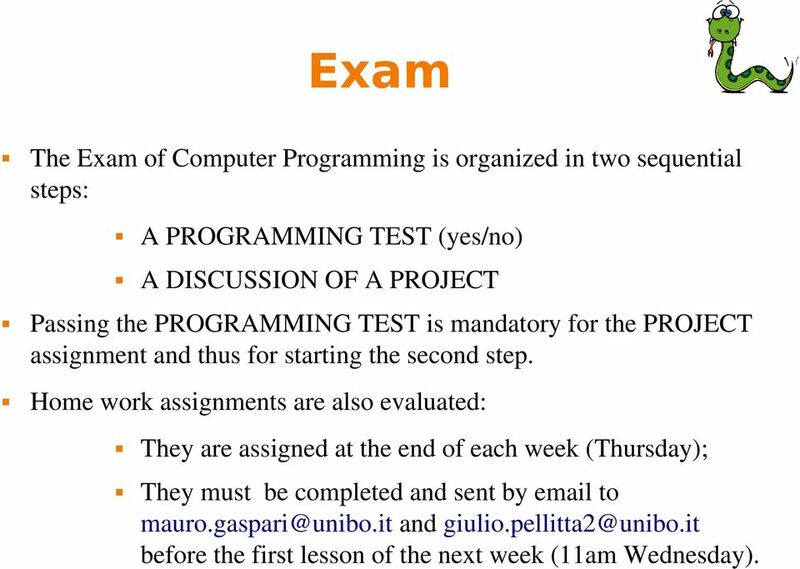 7 Exam The Exam of Computer Programming is organized in two sequential steps: A PROGRAMMING TEST (yes/no) A DISCUSSION OF A PROJECT Passing the PROGRAMMING TEST is mandatory for the PROJECT assignment and thus for starting the second step. Home work assignments are also evaluated: They are assigned at the end of each week (Thursday); They must be completed and sent by to and before the first lesson of the next week (11am Wednesday). 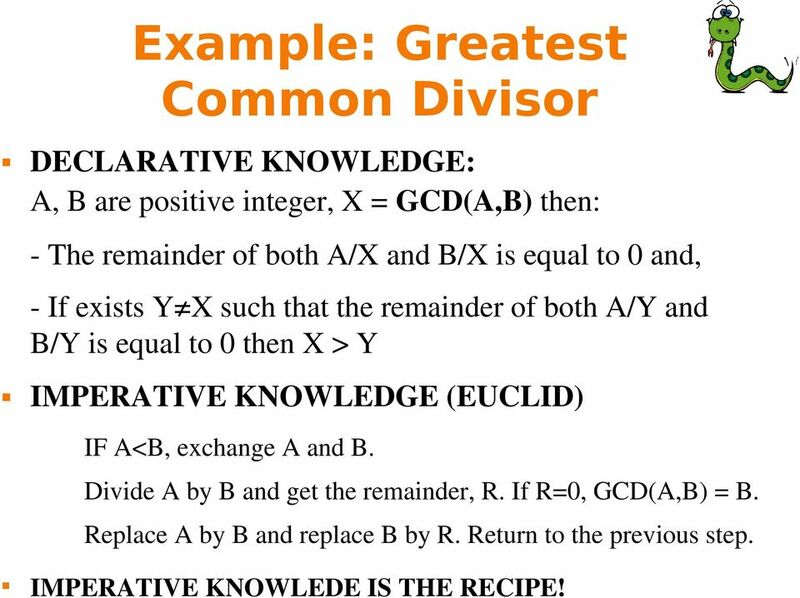 10 Example: Greatest Common Divisor DECLARATIVE KNOWLEDGE: A, B are positive integer, X = GCD(A,B) then: The remainder of both A/X and B/X is equal to 0 and, If exists Y X such that the remainder of both A/Y and B/Y is equal to 0 then X > Y IMPERATIVE KNOWLEDGE (EUCLID) IF A<B, exchange A and B. Divide A by B and get the remainder, R. If R=0, GCD(A,B) = B. Replace A by B and replace B by R. Return to the previous step. IMPERATIVE KNOWLEDE IS THE RECIPE! 11 What is a Computation? A computation is a recipe: a sequence of (simple) instructions (this is also called program). Is it possible to build a mechanical process to capture that set of computations? 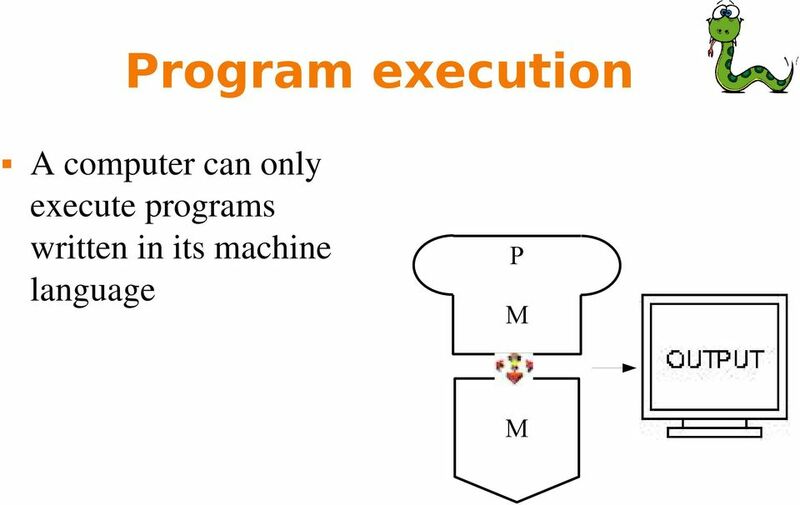 Yes, for example building a simple circuit to do this: fixed-program computer (for example a dishwasher program). 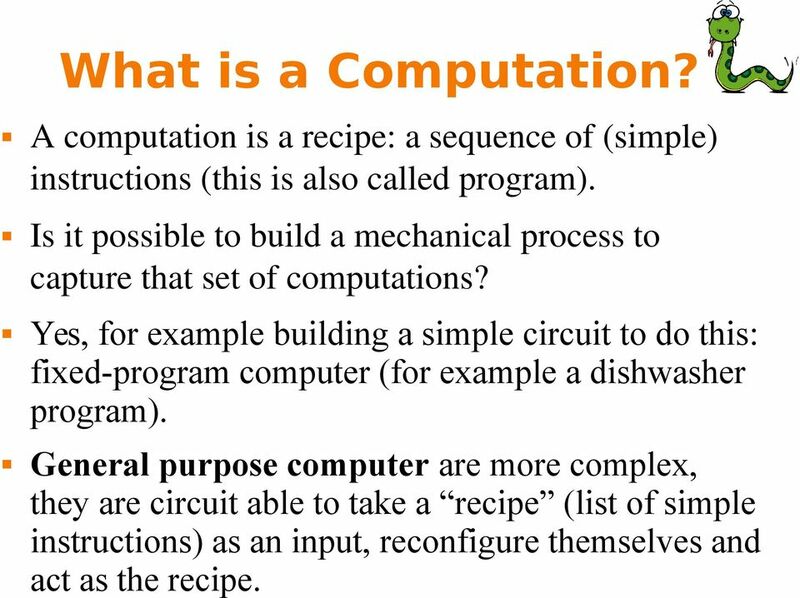 General purpose computer are more complex, they are circuit able to take a recipe (list of simple instructions) as an input, reconfigure themselves and act as the recipe. 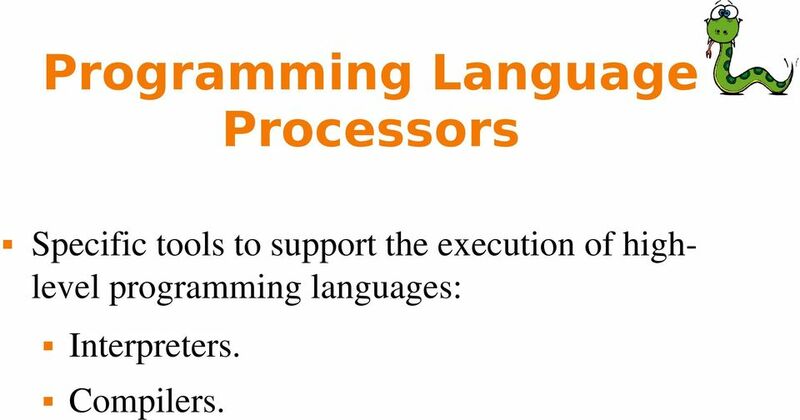 20 Programming Language Processors Specific tools to support the execution of highlevel programming languages: Interpreters. Compilers. 25 Instructions input: Get data from the keyboard, a file, or some other device. output: Display data on the screen or send data to a file or other device. math: Perform basic mathematical operations like addition and multiplication. conditional execution: Check for certain conditions and execute the appropriate code. repetition: Perform some action repeatedly, usually with some variation. Programming = the process of breaking a complex task into smaller and smaller subtasks until the subtasks are simple enough to be performed with one of these basic instructions. 26 Bugs and Debugging! Bugs Debugging (the process of tracking down bugs) Why we introduce this concept here? Is an essential skill associated to computer programming. In principle all the programs may have bugs! Bugs are frequent in programming, but they can be solved with debugging! 27 Different kinds of errors Syntax errors: Python can only execute a program if the syntax is correct; otherwise, the interpreter displays an error message. Syntax refers to the structure of a program and the rules about that structure. If there is a single syntax error anywhere in your program, Python will display an error message and quit. Runtime errors: these errors do not appear until after the program has started running. These errors are also called exceptions because they usually indicate that something exceptional (and bad) has happened. Semantic errors: If there is a semantic error in your program, it will run successfully (without error messages), but it will not do the right thing. It will do something else. 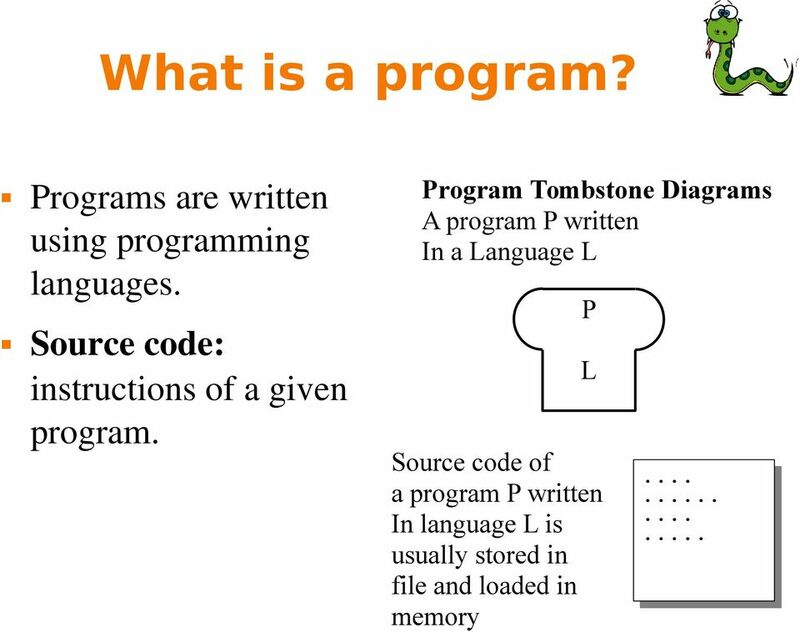 The meaning of the program (its semantics) is wrong. Identifying semantic errors can be very tricky. 28 Debugging Debugging is like detective work: you are confronted with clues, and you have to infer the processes and events that led to the results you see. Experimental science; you have an idea about what is going wrong, you modify your program and try again. If your hypothesis was correct, then you can predict the result of the modification, and you take a step closer to a working program. If your hypothesis was wrong, you have to come up with a new one. Sherlock Holmes When you have eliminated the impossible, whatever remains, however improbable, must be the truth. Programming => debugging: programming is the process of gradually debugging a program until it does what you want. 29 Formal languages Natural languages are the languages people speak, such as English, Spanish, and French. They were not designed by people they evolved naturally. Formal languages are languages that are designed by people for specific applications. For example, the notation that mathematicians use is a formal language that is particularly good at denoting relationships among numbers and symbols. 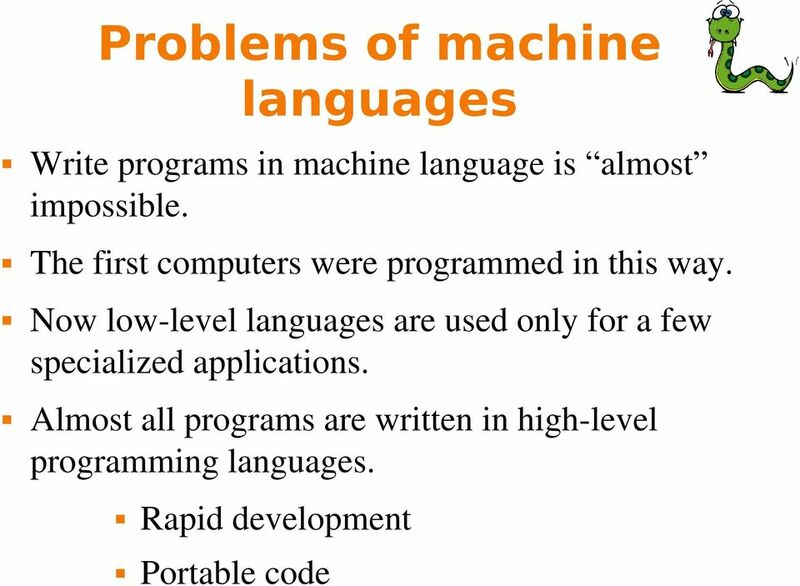 Programming languages are formal languages that have been designed to express computations. 30 Syntax Formal languages tend to have strict rules about syntax. For example, = 6 is a syntactically correct mathematical statement, but 3+ = 3$6 is not. Two levels of syntax rules: Tokens are the basic elements of the language, such as words, numbers, and chemical elements. One of the problems with 3+ = 3$6 is that $ is not a legal token in mathematics. Structure of a statement: the way the tokens are arranged. The statement 3+ = 3 is illegal because even though + and = are legal tokens, you can t have one right after the other. Parsing: is the process that analyse a sentence finding and understanding its structure. 31 Formal Languages vs Natural Languages Although formal and natural languages have many features in common tokens, structure, syntax, and semantics there are some differences: ambiguity: Natural languages are full of ambiguity, which people deal with by using contextual clues and other information. Formal languages are designed to be nearly or completely unambiguous. redundancy: In order to make up for ambiguity and reduce misunderstandings, natural languages employ lots of redundancy. As a result, they are often verbose. Formal languages are less redundant and more concise. literalness: Natural languages are full of idiom and metaphor. Formal languages mean exactly what they say. 32 Semantics Semantics: concerns the meaning of instructions, thus the meaning of the constructs of the language. 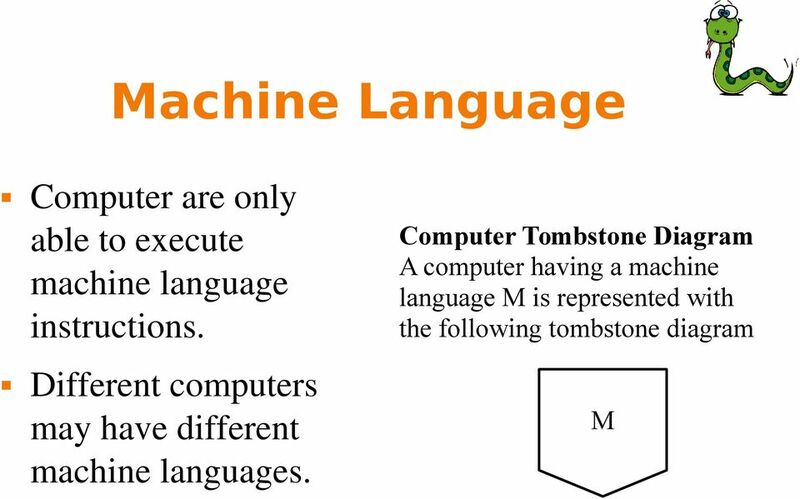 Semantics of programming languages: Informal semantics (manual). Formal semantics (computer scientists): useful for building programming languages processors. 33 Getting Started Python installation you should install the last 2.7 version The last version of python is 3.3. and it is slightly different from version 2.7. The most significant differences are reported in the textbook. 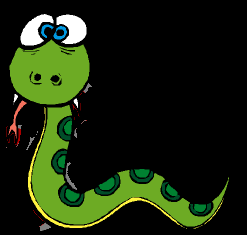 Python interpreter Python IDE: include a text editor specific for programming and debugging tools. 34 The python interpreter Python is an interpreted language. There are two ways to use the interpreter: Interactive mode: you type Python programs and the interpreter displays the result: >>> Script mode: you can store code in a file and use the interpreter to execute the contents of the file (script). By convention, Python scripts have names that end with.py. 36 The first program Traditionally, the first program you write in a new language is called Hello, World! because it just prints this sentence. In Python, the implementation is very simple: print 'Hello, World!' This is an example of a print statement, which displays a value on the screen (output statement). The quotation marks in the program mark the beginning and end of the text to be displayed. 37 Exercises Try the interpreter. Run the Hello World program both in the interpreter and as a script. Computer Science 217 Midterm Exam Fall 2009 October 29, 2009 Name: ID: Instructions: Neatly print your name and ID number in the spaces provided above. Pick the best answer for each multiple choice question. Compilers. 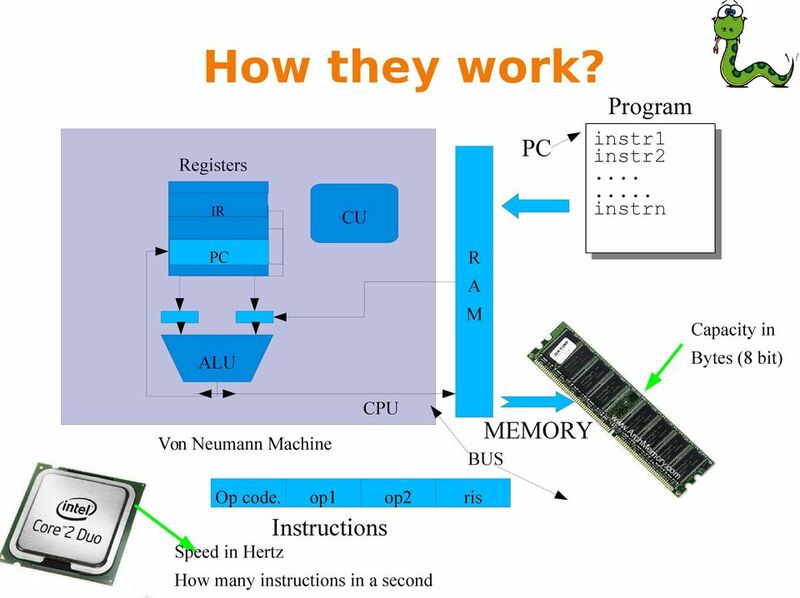 Introduction to Compilers. Lecture 1. Spring term. Mick O Donnell: michael.odonnell@uam.es Alfonso Ortega: alfonso.ortega@uam. 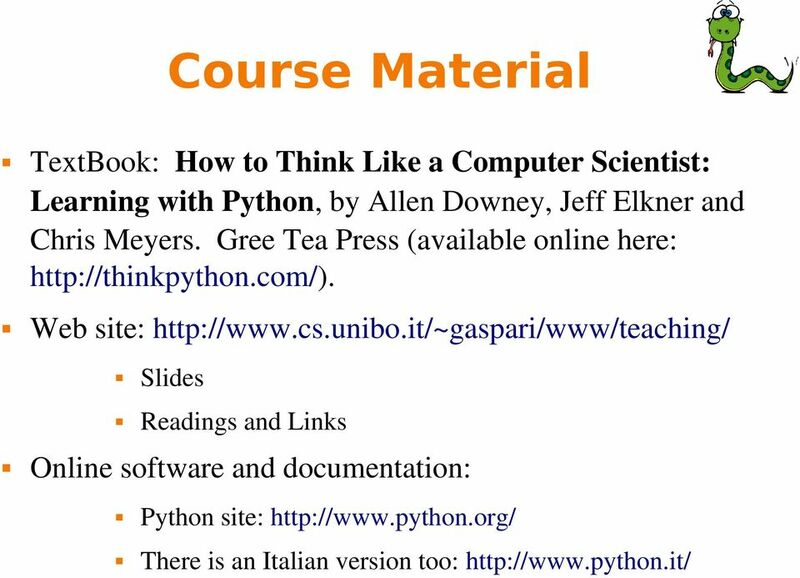 CS101 Lecture 24: Thinking in Python: Input and Output Variables and Arithmetic Aaron Stevens 28 March 2011 1 Overview/Questions Review: Programmability Why learn programming? 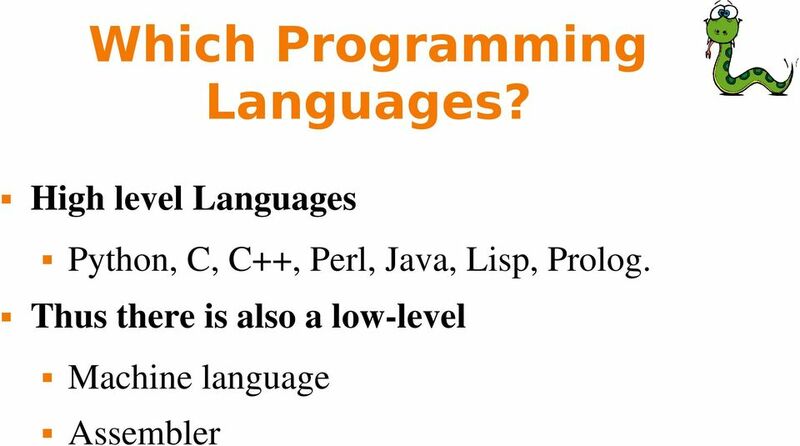 What is a programming language? 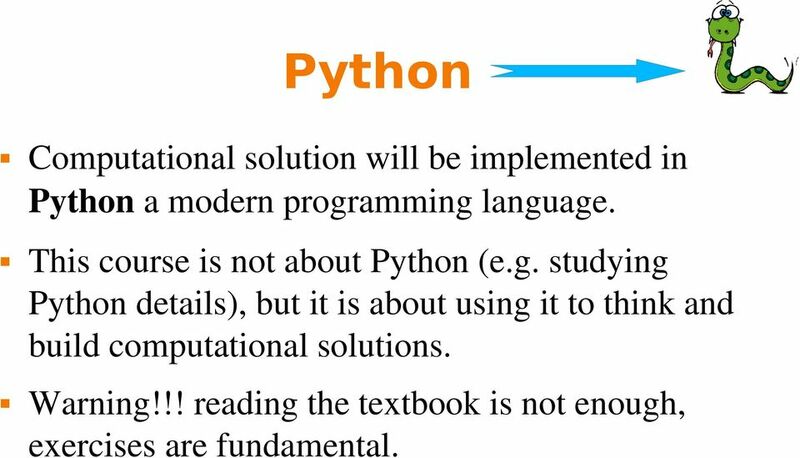 We will learn the Python programming language. Why? Because it is easy to learn and many people write programs in Python so we can share. 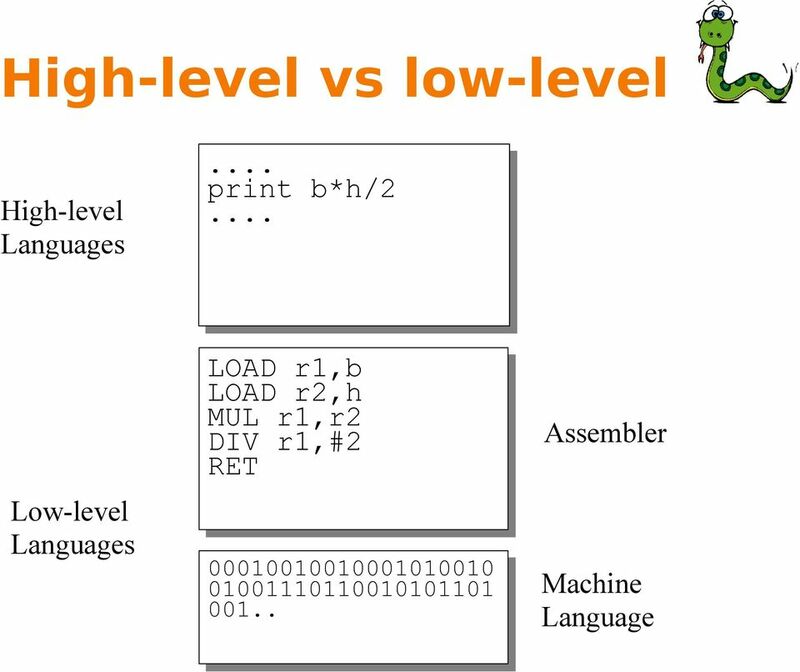 LING115 Lecture Note Session #4 Python (1) 1. Introduction As we have seen in previous sessions, we can use Linux shell commands to do simple text processing. We now know, for example, how to count words. Introduction Welcome to our Python sessions. University of Hull Department of Computer Science Wrestling with Python Week 01 Playing with Python Vsn. 1.0 Rob Miles 2013 Please follow the instructions carefully. Algorithms are the threads that tie together most of the subfields of computer science. Building Applications Using Micro Focus COBOL Abstract If you look through the Micro Focus COBOL documentation, you will see many different executable file types referenced: int, gnt, exe, dll and others.